Third of a three part series, Niko Georgiades takes on a journey through Greece’s post-capitalist alt. economy, this time by analysing the latest developments around FairCoop. Originally published in Unicorn Riot Ninja. Niko Georgiades: Athens, Greece – Tools born from the internet, applied across autonomous networks and movements seeking alternatives to capitalism, are providing the infrastructure of alternative societies. In the last of our specials on community currencies and alternative economies, we showcase FairCoop, a self-organized and self-managed global cooperative created through the internet outside the domain of the nation-state. During a conference on alternatives to capitalism inside of the self-organized and squatted Embros Theater in Athens, Greece in the summer of 2017, a Catalan speaker (who remained anonymous for safety purposes) gave a presentation on FairCoop, which informed much of this reporting. Alternative economies are typically separate economic structures operating outside of the traditional economy and based on the common principles of a community. FairCoop is a function of an alternative economy and was built out of the necessity to provide an “alternative system outside of capitalism” and merge many autonomous movements and networks together to form a society based on each community’s values. FairCoop was created a few years after a nearly half a billion euro banking system expropriation action from 2006-2008, generally attributed to Enric Duran. The expropriation of monetary value from the banks was used to fund social movements and as a way to jump-start alternatives to the capitalist system. Since the creation of the Integral networks in Spain seven years ago, “a lot of people [have been] working for the commons” as there are more than 1,000 projects that are autonomously self-organizing to create cooperative networks of sharing. The idea for FairCoop was brought to an assembly in 2014 as a proposal by Enric Duran and was created by people within the movement to serve as economic infrastructure for a new society. “Usually the powerful money markets attack the weak economies and they get their resources with inflation and things like that. So, for centuries people have lost a lot of resources, a lot of capital” from those in control of the money – the speaker continued, “with FairCoin we are, like, revenging on that, let’s say, and we are recovering value.” They are growing that value to “use it for the commons” and assist in building their self-managed alternative society, said the presenter. “They’re are many people in more than 30 countries” that have combined their local currencies and communities into autonomous local nodes and are connected in a network of cooperatives, said the speaker, who gave examples in the presentation about a Guatemalan and Greek sharing network. To build “a society without money, takes money,” and also requires having a plan to fight against capitalism by empowering the “local, regional, and global level,” so, the speaker said FairCoop created a “global assembly” to determine the value of the currency in a way of “self-management in the political process, not in the market“. FairCoop was described as “a political movement building an alternative” that operates with many open decentralized working groups and assemblies deciding by consensus what actions to take in the FairCoop. FairCoop utilizes FairCoin cryptocurrency. Cryptocurrencies, the most famous being Bitcoin, are digitally created on the internet, decentralized, and out of the control of central governments. They utilize FairCoin to the “benefit of the self-management of the alternative economy, not in the benefit of decentralizing capitalism that is around Bitcoin,” and to economically sustain the process of building the network of FairCoop. FairCoin was developed “as a transition tool for building that eco-system at the global level that can be useful for supporting the building of autonomy and the building of self-organizement” around the world, said the speaker. The speaker said that with the self-management of FairCoin, they are recovering value instead of extracting it from the people as the current banking system with its money markets does. When asked for a practical example of how FairCoop could be put to use in the self-managed Embros Theater, the speaker said that the first step would be to start accepting FairCoin for the transactions of economy inside the theater, such as beer. 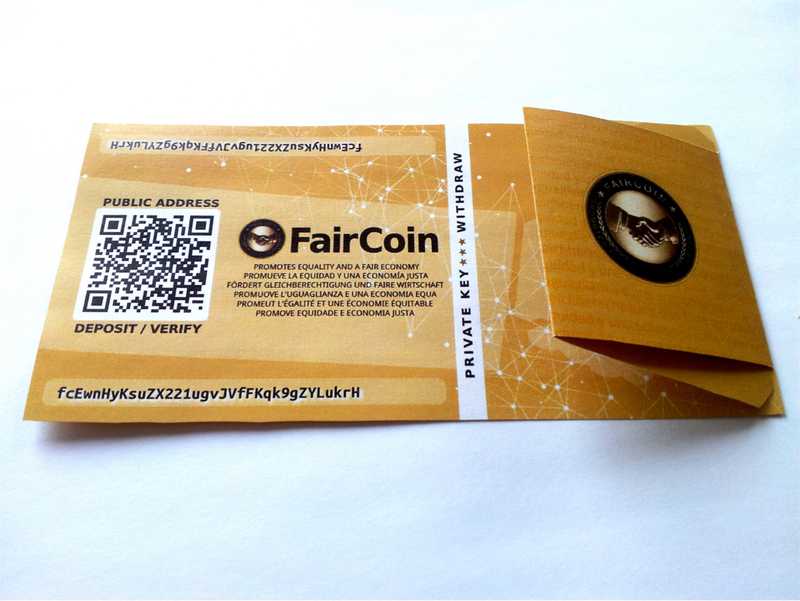 The next step would be to share that you accept FairCoin, which will then be seen in the FairCoop network and when more people start exchanging FairCoin, local nodes create assemblies focusing on different qualities that branch out to the global networks.